day night imaging and video image storage. Within one hour of being on site, our Rapid Deployment CCTV Installers will have a mobile CCTV tower system in place. The tower utilises the latest technology in detection, audio broadcast, day-night imaging and video image storage. This is all complete with transmission equipment. This system is designed to work in conjunction with a manned guard service. You can deploy the CCTV trailer to cover the required areas of the site with infrared movement detectors. Consequently, you will be able to record all activity 24/7 and during normal hours. When armed, the trailer and detectors trigger an alarm sending images to the Monitoring Station. Your operator can then alert either the manned guard or the Police to attend the site. These systems are designed to be deployed as frequently as required on multiple sites. Finally, they are extremely stable and secure from attack. Dome camera with 26:1 zoom. Wiper and twin IR illuminators with optional white light integration. 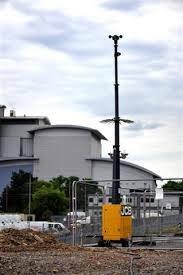 Four Optex 30M/20M or 40M/10M high-performance mast-mounted Detectors with front and rear creep zones. External high-gain Omni-directional 4G/3G tri-band antenna. External 30-watt horn speaker for live audio. 1TB hard drive DVR, 4G/3G embedded software and advance point to shoot telemetry control. Dual Voltage marine-grade charger and twin 12V DC UPS battery back up. Are you interested in our CCTV products? Would like our Rapid Deployment CCTV Installers to visit your Maidstone, Medway or Kent business? If so, please do not hesitate to Get In Touch today and one of our expert team will be happy to help.